Before Nancy Silverton and Mario Batali made waves with Mozza and its artisanal pies, there was Wolfgang Puck and his pizzas. The Austrian didn't invent the California-style pizza but he is widely credited as the man who popularized it in the 80s. 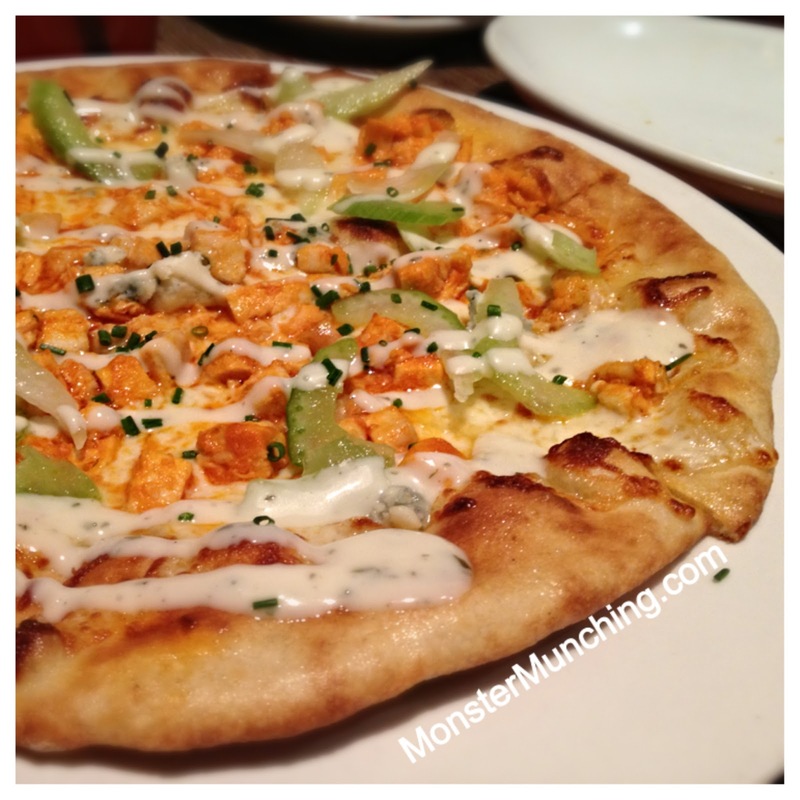 His success inspired such empires as California Pizza Kitchen. But now, with every new pizzeria doing the what’s-old-is-new thing, his kind of pizza seems as fashionable as parachute pants. So when I went to eat at South Coast Plaza's Wolfgang Puck Bistro after all these years--the first time I’d ever done so--it felt more like visiting an distant uncle I never got to know. And it looked as though he was now well past his prime. The restaurant has now become as well-worn as a roadside diner. But the pizza was everything I expected it be, and maybe a little more. The crust is dead flat, the same thickness and texture from the leading edge to the middle, but the topping I chose (and the one our tired-looking waitress recommended) actually tasted like what was advertised: a complete Buffalo wing appetizer. Not only was there a vinegary hot-sauce reminiscent of the last time you were at a sports bar, but also drizzles of blue cheese dressing, and pieces of celery. The irony was thick: here was a pizza invented in California in the 80s, paying homage to an appetizer invented in New York in the 60s. 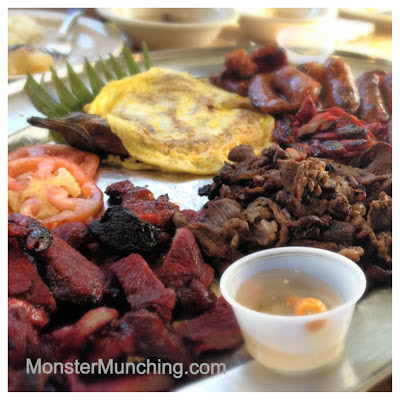 Other than the full English breakfast, there may not be a more fat-ladened, protein-rich, artery-hardening way to start your day than what you see above: the breakfast platter at Salo-Salo Grill in Cerritos. Like a meat congress, it has all the major barnyard animals represented within the brim of its wide metallic dish. The sugary pork sausage known as longanisa is there, bifurcated and seared to crispness on its cut side. You eat it with rice, with the sausage leaching its lip-smacking grease. You douse it with pepper-laced vinegar in an attempt to cut through its richness. But then there's the mountain of tangy beef tapa; and also, the pork and chicken tocino, both cured with sugar and possibly a little food coloring that it looks and tastes like Chinese BBQ. There's a few slices of tomato in attendance, which does little but function as garnish. Last but not least, there is a tortang talong, an eggplant omelet, which accounts for about the only real, significant vegetable on the plate. True, this platter is not meant for one person. It is, in fact, just one of many platters that take the guesswork of ordering and decides, once-and-for-all, that every member of your family is going to feast on a whole lot of BBQ, a mess of seafood, a pile of fried stuff, or in this case, greasy-fatty-delicious breakfast meats for dinner. Dinner is, by the way, the best time to eat this, because, well, you're going to want to sleep afterwards. What is this strange, flower-looking object? An Armenian meringue cookie sandwich, or at least that's what I'm calling it. If there are any Armenians in the audience or polyglots who might know what its proper name is, please chime in. I choose to call it this because to describe it as just a meringue, a cookie, or a sandwich would be insufficient. It does, in fact, contain a filling of chopped hazelnuts suspended in a schmear of what I have to guess is either hazelnut paste, speculoos, or buttercream. This is "sandwiched" between two swirly meringue cookies. And when you eat it, it kind if makes you lightheaded--your brain tells your mouth you need more of this in your body. I would imagine this is what happens with drug addicts. The first thing you think as you look at it is that it will be too sweet, as most meringues are...and it is sweet, but then somehow the thing manages to pull itself back from the brink. It is as if you could combine the best parts of sugar-derived junk foods (like cotton candy) and make it classy and enjoyable for grown ups. The meringue itself is a thing of wonder, simultaneously sticky, chewy, crumbly, crunchy--a texture somewhere between taffy and a just toasted marshmallow, and already addictive. But as the base for that creamy, chunky, buttery, vanilla-scented filling, it fulfills its true destiny. The first time we had it, a friend of ours served it to us when we visited her home. Upon tasting it, we asked and found out where it's from: Karina's Cake House in Glendale, which charges a buck fifty for each. When we found ourselves near Glendale, we bought a dozen and then rationed ourselves one-a-day, because, well, we are responsible sugar addicts. But we discovered that these meringue cookie sandwiches are at their best when eaten within a day of purchase. It loses its characteristic chewiness after 24 hours. So here is the subject of a future post: Is it possible for two people to eat a dozen of these meringue cookie sandwiches in a 24-hour-period and avoid diabetes? 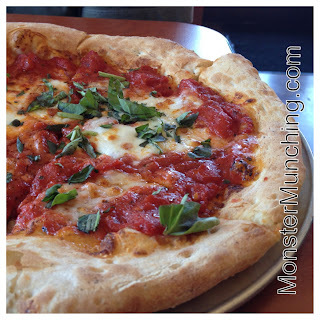 The margherita pizza at Stonefire Grill is better than it has any business being. It defied my expectations, because Stonefire was not a place I ever thought could produce a pizza like this--a pizza that is pretty darned close to the Mozzas and Orticas of our world. Perhaps I liked it so much because I didn't think I'd like it, like the film Idiocracy, which I saw with very low expectations but now has me chuckling every time I pass by a Fuddruckers. This pizza is like that. It surprised me. What I anticipated was a dense, doughy crust--a pizza that tasted more like something you'd get in Naples, Long Beach rather than Naples, Italy. I expected a pizza more like the one Stonefire's closest competitor makes, which shall remain nameless but rhymes with Flo's. What I got instead was light and thin-crusted, a pie that was hand-formed, coaxed to have bulbous crust you wanted to eat, baked in an oven that blistered it to charred pock marks similar to Batali's much-lauded pies. I even liked the crust here better than the one I had at Newport Beach's Mozza during its first month in business, which was overworked at the time. Stonefire's has an elastic-but-not-too-taut pull. The toppings were applied with a measured amount of restraint. It was a good, honest, serviceable, impressive pizza pie. Like Idiocracy, it charmed me, but I think I may need to try it again at least several more times. A friend who was similarly delighted at Idiocracy, saw it again, this time convincing his wife to watch it with him. Afterward he told me he thought the film was still good, but he saw more flaws the second go round...and his wife thought it was rubbish.